ASSOCIATED PRESS France’s Kylian Mbappe, right, scores his side’s third goal during the round of 16 match between France and Argentina at the World Cup at the Kazan Arena in Kazan, Russia, on Saturday. KAZAN, Russia (AP) — Teenager Kylian Mbappe scored two goals in a five-minute span to lead France over Argentina, 4-3, Saturday and into the World Cup quarterfinals. The loss could be the end of Lionel Messi’s international career. Mbappe, a constant threat to Argentina’s creaking defense with his speed and skill, was at the heart of France’s often-breathtaking display, particularly in the middle part of the second half. 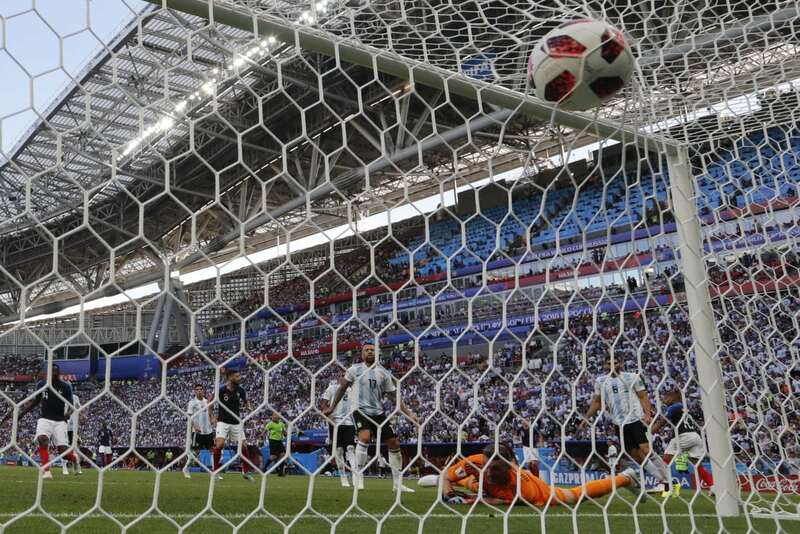 With the score even at 2-2, the 19-year-old Mbappe got his first goal with a cool finish from a tight angle in the 64th minute, his low shot going under Argentina goalkeeper Franco Armani. SOCHI, Russia (AP) — Edinson Cavani scored twice and Cristiano Ronaldo none, giving Uruguay a victory.